Social media expands our ability to communicate with a wide and geographically extended audience. But it also brings new ways to fall into the basic traps of relational systems. Here’s how to recognize and avoid triangling through social media. What is a relational triangle? A triangle is a three point relational system. It begins with tension between two people. Instead of resolving the presenting issue, a third party is drawn in, which significantly lowers the anxiety for one of the original people and increases it for the others. Triangling stabilizes relationships but doesn’t solve problems because triangles shift the tension around. First two people interact closely and one person feels left out or uncomfortable. Then the outsider position moves and two different people feel comfortable. Texting often involves multi-tasking. This can lead to the temptation to draw others into a two person situation. For example, Chatty received a message from Special Friend while hanging out with her Other Friend Group. Special Friend: Where are you? You said you’d be here at 2. Chatty: Hey, I’ve got to get going, Special Friend is waiting for me. Other Friend Group: She can wait a few minutes, let’s finish this. Chatty: I’ll be there in 15. Need to finish something. Special Friend: 🙁 Feeling hurt. You always make me wait. Chatty: Crap! Now he’s upset. I was supposed to be there 10 minutes ago. Other Friend Group: Chill. Special Friend is just impatient. He can wait. Chatty: Stop being impatient. I’m coming. At first Chatty feels stressed about Special Friend’s text message and is ready to go meet up with him to deal with the situation. 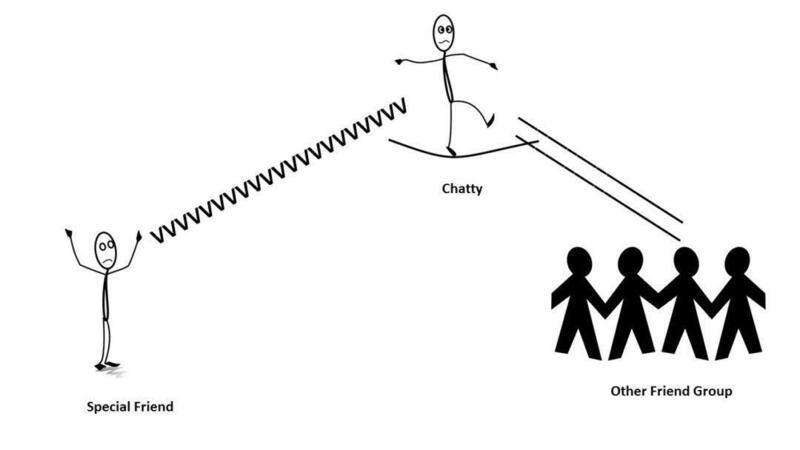 When Chatty draws her Other Friend Group into the conversation, they convince Chatty that her friend is at fault, not Chatty. Now Chatty feels less anxious about the situation, but the issue between her and Special Friend is unresolved. · Making your own decisions. Don’t let others interfere with a private conversation. · Think about how your actions affect the other person and take responsibility when you mess up. · Friends may be willing to defend you, but sometimes this can encourage you to avoid taking responsibility. Think about whether their response is helpful or not. · Set ground rules for texting and relationship. See “Texting and Relationship” . A conflict occurs at a family gathering. Family Member says or does something that offends Cousin’s Girlfriend. Family Member doesn’t understand why the comment or action would be offensive and assumes Cousin’s Girlfriend is being unfairly reactive and disrespectful. Family Member strongly defends himself. Cousin’s Girlfriend feels even more misunderstood and disrespected and responds more vehemently. This escalates until others in the room are aware of the conflict. Family Member feels more and more offended, embarrassed and angry at Cousin’s Girlfriend. Family Member leaves the gathering in a huff. Family Member receives lots of sympathy posts and commiseration from people who have no idea what happened between the two people. None of his Facebook contacts were at the gathering. None know the details of what happened. As a result Family Member feels justified in his words and actions. He feels much better. By triangling people in who were not part of the original conflict he decreases his anxiety without needing to deal with the original situation. Note: This triangle could become even more complex if others get involved, for example Cousin might defend his girlfriend. Or Cousin might be a Facebook friend and get involved in the conversation on-line without giving any more details about what actually happened. Communicate directly with the other person and work to understand their point of view. This can be done in person or in a private message. Take time to reflect privately on what happened. Ask yourself, “Why might the other person have reacted that way?” “What was my role?